Black Iguana is a black and vibrant green wordpress template designed by Erik Gyepes. 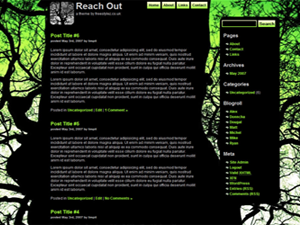 The wp theme’s header graphic is green while the main content area is black. This is a two column wp skin. 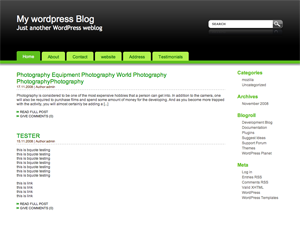 The sidebar is located on the right side and it includes all the normal wordpress fields. Links are colored green while the normal text is white. 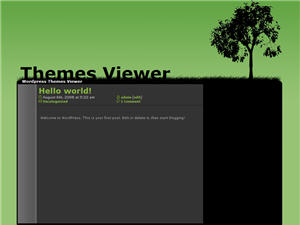 Isolation is a green/black WordPress theme utilizing MooTool’s accordian. Utilizes GD Image for horizonal titles, which can be disables with option page. It’s not your typical wordpress template. Check out the preview and you will see what I mean. 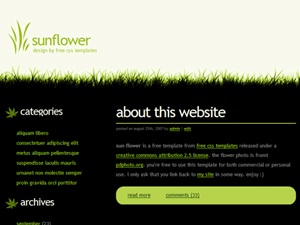 The header graphic shows a black tree and some grass while the blog’s main title is shown just above the grass. This wordpress theme is split into two sections, the upper window contains your latest posts while the bottom one contains the standard wordpress menus. 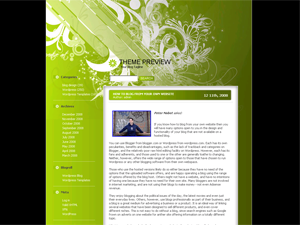 This wp theme was designed by Chris Ensell. 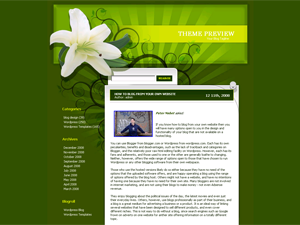 Green Design is a beautiful 2 column wordpress theme designed by Erik Gyepes. In it’s header graphic it features amazing artistic shapes. Sidebar is green and possitioned on the right hand side while the main content area is white. Post titles also have green background and are written in white letters. Simple but authentic looking theme with a unique color blend of black, green and white! 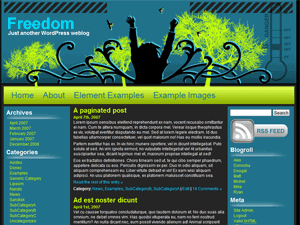 This is a two columned fixed width theme that comprises of a sidebar and a large content area. The theme features a distinct header with a proper blend of shaded black color and green colored traditional navigation bar that gives the users a proper idea of the other categories included in the website. The header also features a unique search area for the ease of the users. The content area and the sidebar in the theme have a white base with green colored content titles and sidebar titles thus giving it a simple and very neat appearance. Medicine WordPress Template is a authentic looking wp theme with a very beautiful color scheme of white and a soothing green color! 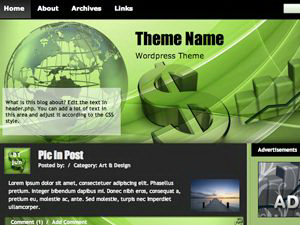 The header of the theme is very distinct and focuses on the meaning of the theme. The theme focuses on medical science and the latest technologies. The header features the traditional navigation bar that helps you to link up with the other categories. This is a fixed width theme with three columns. 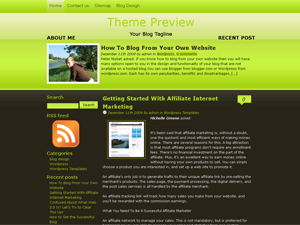 The theme has two sidebars which helps you to set a link with the other pages. The content area displays the posts that are updated daily by the users. 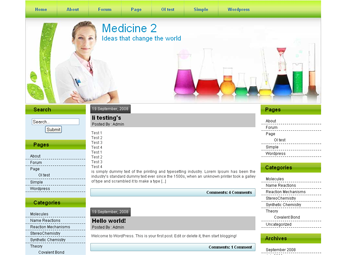 The theme has a distinct search area for the users.